Throughout the years, terrorist organizations have deliberately targeted Israeli civilians with rockets fired from Gaza for the purposes of maximizing innocent casualties and striking fear into the population. By firing from schools and hospitals, Hamas is essentially committing a double war crime – striking innocent civilians while embedding itself among its own population centers. Its fighters even fired rockets towards Jerusalem recently without regard to the Muslim holy sites—something that even Saddam Hussein never dared to do. One could only imagine the consequences of a Hamas rocket hitting the Al-Aqsa Mosque on the Temple Mount. The use of women and children as human shields serves a dual purpose. Terrorists believe this tactic deters extensive Israeli retaliation because the Jewish state makes great efforts to minimize non-combatant casualties. When Israel drops mass leaflets and sends text messages to warn the Palestinians of an impending response, Gazan terrorists are given ample time to desert their positions and avoid harm. However, an often overlooked perspective is that Hamas actually gains from increasing Palestinian collateral damage in the crucial public relations war against Israel. The more pictures of civilian Palestinian women and children killed, the more Israel is perceived to be the aggressor, leading to further deterioration in the international community's support for its actions. Israel's military superiority leaves Hamas knowing that the propaganda war is the only battle they can win. There is tremendous incentive for Hamas to inflate the statistics regarding Palestinian civilians caught in the crossfire. But what if Hamas' rockets are causing innocent Palestinian casualties? This issue has come to the fore in the recent violent escalation between Israel and Hamas. 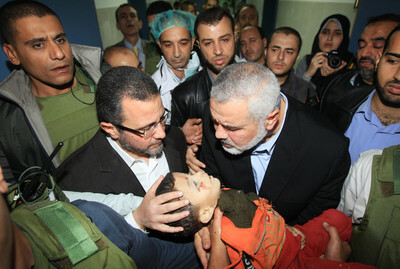 An infamous image has been disseminated throughout mainstream media outlets showing senior Hamas leader Ismail Haniyeh and Egypt's Prime Minister Hisham Kandil embracing the body of a dead Palestinian boy (Mahmoud Sadallah), who was allegedly killed by an Israeli air strike. Despite Israel's observance of a cease fire during the Egyptian Prime Minister's visit to Gaza, CNN's report by Sara Sidner of the Sadallah incident alleges that the boy was killed by the Israeli Air Force. "… there were signs on Saturday that not all the Palestinian casualties have been the result of Israeli air strikes. The highly publicized death of four-year-old Mohammed Sadallah appeared to have been the result of a misfiring home-made rocket, not a bomb dropped by Israel. The child's death on Friday figured prominently in media coverage after Hisham Kandil, the Egyptian prime minister, was filmed lifting his dead body out of an ambulance. "The boy, the martyr, whose blood is still on my hands and clothes, is something that we cannot keep silent about," he said, before promising to defend the Palestinian people. "The Abu Wardah family woke up on Friday morning to word that a hudna — Arabic for cease-fire — had been declared during the three-hour visit of the Egyptian prime minister to this embattled territory. So, after two days of huddling indoors to avoid intensifying Israeli air assaults, Abed Abu Wardah, the patriarch, went to the market to buy fruits and vegetables. His 22-year-old son, Aiman, took an empty blue canister to be refilled with cooking gas. The younger children of their neighborhood, Annazla, in this town north of Gaza City went out to the dirt alley to kick a soccer ball. But around 9:45 a.m., family members and neighbors said, an explosion struck a doorway near the Abu Wardah home, killing Aiman Abu Wardah as he returned from his errand, as well as Mahmoud Sadallah, 4, who lived next door and had refused his older cousin's pleas to stay indoors. "Mahmoud Sadallah, the 4-year-old Gaza boy whose death moved Egypt's prime minister to tears, was from the town of Jebaliya, close to Gaza City. The boy died Friday in hotly disputed circumstances. The boy's aunt, Hanan Sadallah, and his grief-stricken father Iyad — weak from crying and leaning on others to walk — said Mahmoud was killed in an Israeli airstrike. 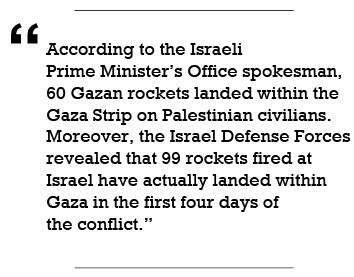 Hamas security officials also made that claim [Emphasis added]. Israel vehemently denied involvement, saying it had not carried out any attacks in the area at the time [Emphasis added]. According to the Israeli Prime Minister's Office spokesman, 60 Gazan rockets landed within the Gaza Strip on Palestinian civilians. Moreover, the Israel Defense Forces revealed that 99 rockets fired at Israel have actually landed within Gaza in the first four days of the conflict. This Palestinian tactic is nothing new, since previous accounts of errant Hamas rockets inflicting death and injuries on Gazans has been reported in previous conflicts with Israel. For example, a Palestinian rocket aimed at Israel in 2006 ended up striking a home in the Gaza Strip, wounding a two-year-old boy sleeping in his bedroom. It is time for all reputable media outlets to engage in real investigative techniques, avoid hasty conclusions, and prevent biased reporting from perpetuating the terrorists' narrative. Why shoudl we give a damn about Palestinian casualties? I'm really growing tired of hearing about how Israel is going to great pains to avoid Palestinian or Gazan casualties. And I'm growing tired of sites like this one trying to expose the lies and deliberate killings by Hamas and the Palestinians. That's fine, but what does it accomplish? No one should give a damn about the Palestinians. They don't give a damn about Israeli civilians killed. In fact, they dance in the streets and pass out candy when it's a really big hit. They made their bed with Hamas and the PLO and whatever other anti-Israel terrorist group is there. The "civilians" there can take the hits, too. Why should Israel care what the rest of the world thinks? No matter what the Israelis do, they get the short end. Hamas is deliberately targeting Israeli civilians. And, as this article reveals, are deliberately causing casualties to create the impression that Israel is massacring "poor, innocent" civilians. Well, they're not so innocent. Israel should shoot back at Hamas, and if civilians get creamed, so what? The U.S. learned the lesson the hard way in Vietnam: You don't fight the enemy on the enemy's terms; else, you lose. Israel should fight to win a war, not to win an "image" contest. If that means flattening half or all of Gaza, tough. We really shouldn't give a damn. Israel, the only secular, civilized state in the Mideast, is fighting for its life. And, please, no one reprimand me with talk about "other considerations" or a "diplomatic solution" or the like. Sixty-five years of "negotiating" with the Arabs and reaching pointless deals with them has only made the situation worse.